Coming out in May, there's a new companion for the Sixth Doctor in The Lure of the Nomad. Mathew Sharpe, a space pilot from the future, and the Sixth Doctor take on the Makara in this new Doctor Who Main Range tale. New companion, Mathew Sharpe (Mathew with one 't', Sharpe with an ‘e'!) is a space pilot from the future who has already been travelling with the Doctor for some time before we meet him in The Lure of the Nomad. 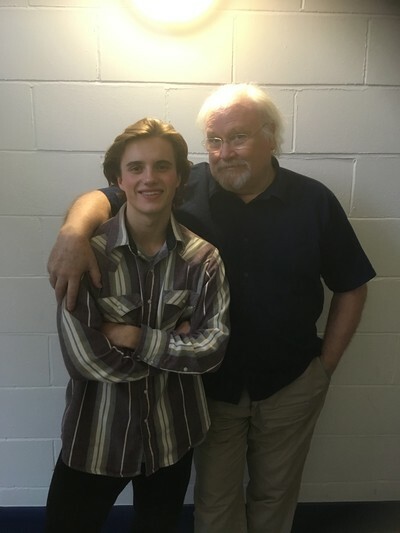 Listeners will recognise Mathew Sharpe actor, George Sear, from his roles as Arthur in AMC's Into the Badlands, Billy Cooper in Will for TNT, two series of Evermoor for the Disney Channel, and Friday Download for the BBC. Matthew Elliott, writer of The Lure of the Nomad, told us about bringing this new companion to the Sixth Doctor: “It's been a great privilege to write the first of what I hope will be many stories featuring the Sixth Doctor's new companion, spacepilot Mathew Sharpe. “As a courier of urgently-needed medical supplies, Mathew's ship is caught in an electromagnetic whirlwind above the planet Ormelia. It's only the timely arrival of the TARDIS that prevents poor Mathew going the way of his vessel. Despite the Doctor promising him just one trip through time and space, they've been together on a number of adventures when we first see them together in The Lure of the Nomad. Mathew is a good-natured soul, quite naive in the ways of the universe, and fiercely loyal to the Doctor; think of him as a cross between Steven Taylor and Harry Sullivan. “I know it seems quite odd that I, another Matthew (with two 't's) should be writing the debut adventure of another Mathew, but I promise you, the choice of name was the decision of Big Finish script editor Alan Barnes. I'm not quite so egotistical as to demand that the new companion should share my name! You can pre-order The Lure of the Nomad (out for release in May) at £14.99 on CD or £12.99 on download. All CD purchases unlock a download option via the Big Finish app and the Big Finish website. Coming next in the Doctor Who Main Range is the finale in a trilogy of adventures with the Fifth Doctor and companions Tegan Jovanka, Nyssa and Adric. Serpent in the Silver Mask was written by David Llewellyn.